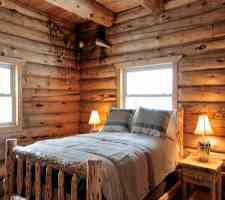 The log cabin conjures images of back-breaking labor, do-it-yourself building, and beautiful character. Log home building aspirations are founded on our belief in wood’s strength and durability. Even though modern builders frequently use only half a log for decor purposes, the wood log’s moisture content (MC) is still the foundation of a log home dream. Historically, log homes and log cabin buildings trace back to Scandinavia and Eastern Europe- both locales of harsh winter climates. Swedes are believed to have erected the first log cabins in Delaware, a much less hostile US climate than settlers faced in their indigenous territory. The proverbial log cabin had come to represent “home” on the American prairies by the early 1800s. 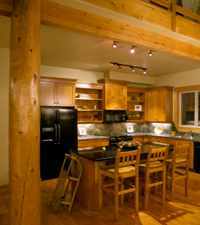 In modern times, properly-processed logs can still handle both outdoor and indoor climates. This is because milled wood is optimally dried to its equilibrium moisture content (EMC), which balances the wood’s internal MC with the relative humidity (RH) levels of its surrounding environment. When trees are cut, they possess “green” MC levels, moisture levels indigenous to the tree itself and its environment in its natural state. Hardwoods and softwoods can differ greatly in their green MC levels so lumber producers must dry all wood species in kilns with well-circulated air at certain temperatures and at certain RH conditions depending upon the wood species being dried to drive the excess MC from the wood cell walls. Once wood reaches its EMC, it can accommodate most slight changes to the ambient RH conditions surrounding it. Proper wood processing stabilizes the wood’s MC to prepare it for a long service life regardless of locale. Lumber mills deploy wood moisture meter technology throughout the production process. From in-line moisture measurement management systems to hand-held wood moisture meters designed for spot-checks, wood professionals are in charge of monitoring and managing the wood’s MC from the moment that any tree comes into the mill from the forest floor. Half-log timber milling processes two roughly equal halves of a single log for siding. Where our predecessors were occupied with fitting whole logs on top of each other to form walls, modern log siding is applied as a covering with the round sides out to create the same appearance. Log siding is typically now available as a decor treatment. Half-logs provide the exact look of true full log homes and can be used both internally and externally. Half-logs simply attach to the 2X framing of a stick frame wall. With half-log siding, you can get the external look of a log home on the outside but not on the inside, as the siding can be installed right over an existing stick framed home. The logs are usually grade stamped and available in a standard or cabin appearance. Common sizes available are 6, 7, 8, 9, 10, 12, 14, and sometimes 15, & 16” diameters. Half log siding commonly comes in cedar and pine, and sometimes Douglas fir and redwood logs are available. The logs are usually kiln-dried to accelerate the drying process. Since a log reaches its EMC at about 6-12% in North America, and since most kiln-dried logs are dried down to about 18-20% MC, kiln-dried logs can be expected to shrink and settle over time but to a lesser extent than green logs. A wood moisture meter is an integral way to maintain a stable wood siding MC. Just as the practice of building with timber logs has evolved over the years, so too has moisture meter technology evolved so that almost anyone can use a wood moisture meter for continuous maintenance of half-log timber siding. Properly using a dependable wood moisture meter from Wagner Meters will help that half-log wood siding seamlessly retain its strength and durability for generations to come.